Want to be notified of new releases in guillemontecinos/itp_spring_2019_live_image_processing? 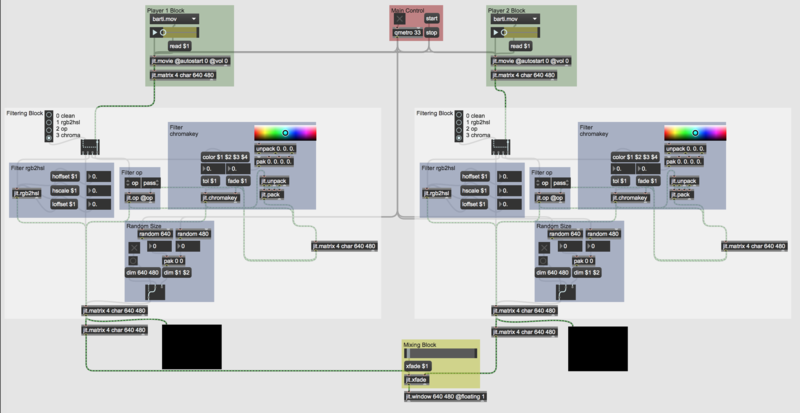 This document and the contents stored in this repo corresponds to the class Live Image Processing taught by Matt Romein, at NYU ITP during the 2019 Spring term. For example I felt curious of recording the movement of bubbles in a boiling glass made water kettle so I took a shoot of the floor's kitchen kettle which also has a funny blue light. As well, I attempted to explore light reflection through a glass of water and the shapes light can make over a surface. On the other hand I explored materials as lumber, synthetic grass and leaves of plants that I found in the floor shelves. Something interesting happened in the last one because they are lightened with a ultraviolet set of LEDs which a particular wave length that made a weird interference when I recorded it. 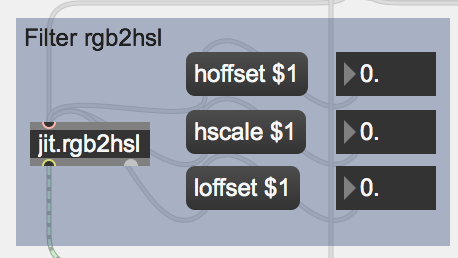 I built a basic video mixer using the jit.xfade function, which receives a float number between 0. and 1. as an input. In this case the number represents the percentage in which the left image is screen versus the right one. Also, I used umenu to easily load the videos into the patch. After that I attempted to apply a downsampling function to one o the channels as we did in class using jit.matrix and it's dim parameter, bur weirdly this size processing affected both left and the final mix after xfade. During this week I worked in the design of my basic video mixer in Max/Jitter. To afford that I took a bunch of example filters showed in class and explored the possibilities that they opened. I explored 4 main effects: rgb2hsl, chromakey, op and random size. rgb2hsl was chosen as an option to saturate the color of the video since it misunderstands the actual color by changing its framework from RGB to HSL. In this case the controls can change Hue offset and scale as well as Lightness offset. 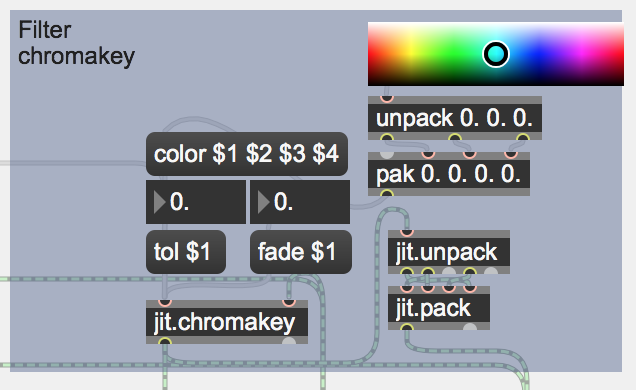 chromakey and op were fed in a feedback loop with their own output –maybe just for now because I didn't want to over-complicate this patch. For op there is a menu connected to it's 1st inlet that allows the user to select which operation want to be calculated. On the other hand, for chromakey there is color palette and selector to set tolerance and fade, both attributes of the object. Finally, a random size block was set after the filtering block as a post processing block. This is the case of the chromakey function I fed with it's own output –after mixing its ARGB planes– to create a weird neon effect. As can be seen in the next next video my exploration wasn't deep in terms of finding psychedelic or weird filtering but was intense in developing a well organized design that could work as a framework where I can incorporate new effects I will find during the next days. The system developed for first performance was built from the video mixer designed during previous weeks. Main differences are that I added a jit.rota bock to scale the image of the channel 1 (left side) and that channel 2 (right side) jit.chromakey and jit.op had the option of being feed by channel 1 matrix as well as through a feedback loop. The performance was designed as a audiovisual experience which goal was to immerse the audience in a sensory experience. For that, pre-recorded footage of southern Chile –shoot by my sister Claudia- and Google Maps was live mixed using the patch, at the same time that music was generated via Ableton Live. For this a Live set was developed, this was controlled by a MIDI controller and sent MIDI messages to the Max patch. Video mixing was live controlled from two sources: most parameters as sliders and toggle buttons were controlled via a Roli Block device –which can be seen in the presentation mode of the patch–, whilst channel 2 color parameters of jit.rgb2hsl and jit.chromakey –as hue, offset, tolerance, among others– were set by the MIDI controller used to trigger live set. The presentation mode of the patch reflects the signal flow divided in channels 1 and 2, which can be independently processed and then mixed. A rehearsal of this performance can be seen below. For better understanding of how the different elements interact, both Live and Max were recorded during the documentation process.